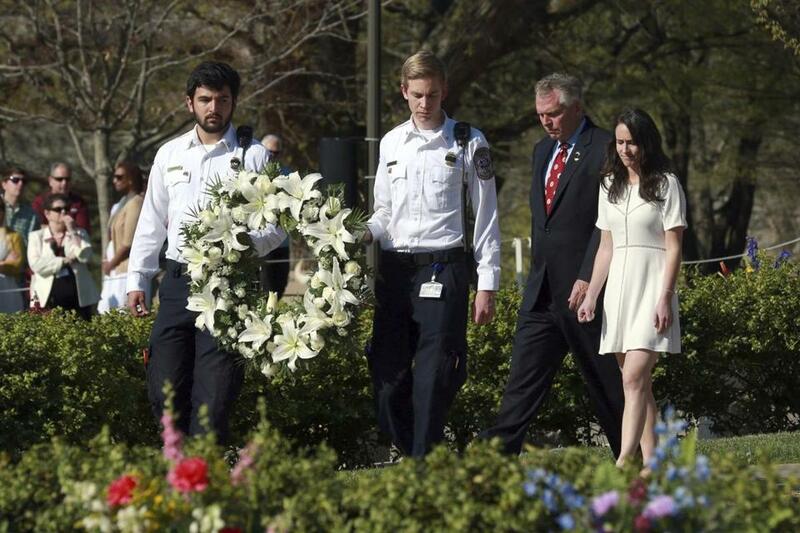 Governor Terry McAuliffe (second from right) and his daughter Dori helped present a wreath in Blacksburg, Va., Sunday. BLACKSBURG, Va. — Ten years after a mentally ill student fatally shot 32 people at Virginia Tech, survivors and families of the slain returned to the campus to honor the lives that were lost that day. Virginia Polytechnic Institute and State University, widely known as Virginia Tech, held a series of events Sunday to mark the anniversary of the deadly campus shooting on April 16, 2007. Virginia Governor Terry McAuliffe and US Senator Tim Kaine were among the 10,000 to 20,000 people expected at the Blacksburg campus for the occasion. Kaine, who was governor at the time of the shooting, said he still vividly remembers the horrors of that day but has also grown close to many of the survivors and the victims’ families. ‘‘We’re going with a lot of different emotions, but we wouldn’t be anywhere else,’’ said Kaine, who attended the service with his wife, Anne Holton. Who Can the GOP Blame For Tax Cuts?